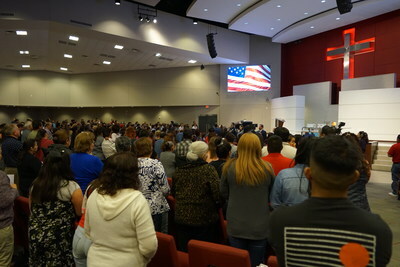 HOUSTON, April 11, 2019 /PRNewswire/ -- At an evening immigration "Know Your Rights" panel hosted by The Universal Church on April 2, 2019, more than 600 community members concerned about immigrants' rights learned how to protect themselves, their families, and loved ones in the face of increasingly aggressive enforcement policy by federal immigration authorities in non-border related stops. While the focus in the media has been on border-related issues, the day-to-day experience of immigrants living across the United States is filled with anxiety and a lack of critical information. The Universal Church hosted more than 600 community members at an immigration "Know Your Rights" panel. Panelists addressed the day-to-day experience of immigrants living across the United States with anxiety and a lack critical information. 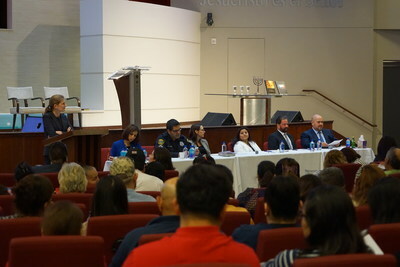 The Panel, held by the Universal Church on Southwest Highway in Houston, offered practical guidance and reviewed legal and constitutional in encounters with police and immigration officials. Claudia Ortega-Hogue, District Director for Congresswoman Sylvia Garcia, and Terence O'Neill of Houston's Office of New Americans and Immigrant Communities delivered opening remarks, both expressing strong support for the immigrant community, in spite of today's challenging political climate. Raed Gonzalez, Senior Attorney, Gonzalez Olivieri LLC. Panelists offered practical guidance for circumstances commonly faced by immigrants, including how every family must prepare to face the challenges if a family member is detained. The panel also discussed how to exercise legal and constitutional rights in encounters with police and immigration officials. The panelists engaged in a lively exchange regarding the controversial Texas law SB4, under which local police cooperate with immigration officials in certain circumstances. The panelists also offered guidance on the importance of not using "notarios" and instead identifying a reputable attorney. Those in attendance were provided resources on free and low-cost legal services in the Houston area. While Houston is not a sanctuary city, Mr. O'Neill and Officer Pantoja both emphasized that immigrants should not hesitate to reach out to police if they are victims of crime, regardless of their immigration status. The Houston "Know Your Rights" immigration panel was the latest in a series of events over the past two years sponsored by The Universal Church in cities across the United States, including in Los Angeles, Chicago, Miami, New York, Houston, Phoenix, Boston and Union City, New Jersey. The event was covered by Houston Public Media, the local affiliate of National Public Radio sponsored by the University of Houston. The Universal Church (www.universalusa.org) is a Bible-based Christian church with more than 300 locations in 33 states. It is one of the fastest-growing churches in the United States.